Architects and Designers are continuing to create innovative geometric forms to satisfy their Client’s branding requirements. While companies today have a need to project an image of innovation and quality, this creates the problem of how to fabricate molds in a quick and cost effective manner. 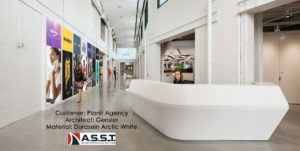 Curved solid surface cladding requires molds to form the heated solid surface to the geometry specified on the architectural drawings. Creating wooden molds by carving them with power hand tools was initially the way it was done. The problem was how to reduce the exorbitant labor costs for creating these molds by hand. Also, using solid hardwood is expensive and was required depending upon the mold design. With ASST’s 5-Axis CNC, we have addressed these problems. Labor costs have been reduced for the customer and new innovative sustainable molding materials can be utilized with this technology. We are also constantly looking for the next generation of materials to create our molds for better durability and machining accuracy. We have found that the only limits to 5-Axis CNC capability is the designer’s imagination and CNC Engineer’s abilities. The evolution of 5-Axis CNC machining will eventually usher us into a world of instantaneous object creation further expanding the boundaries of innovative designs with solid surface. ASST looks forward to the challenges and opportunities this will present! 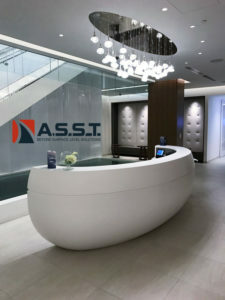 ASST is uniquely positioned to fulfill all aspects of your project. Whatever you need, ASST can build it to your exact specifications, in a safe manner, and to the quality standards you expect. Even our EMR safety rating is outstanding at .793! Contact us now online or call us at 717-630-1251. At some point in your childhood your parents probably told you “to sit up straight” or “don’t slouch”. Although these are well-intentioned instructions, our spines are anything but straight even at birth. 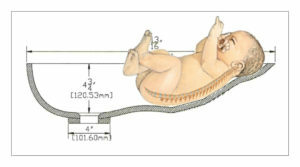 Newborns are in a “Primary Curve” C-shaped fetal position upon birth and for the first few months of life, they do not yet have the muscles to support their head. Research has shown that keeping an infant’s spine straight is not a sound physiological position and in addition to stressing the baby’s spine, it can negatively influence the development of a baby’s hip joints. (Dr. Evelin Kirkilionis, University of Freiburg, 2002). Although there has been much written about adult ergonomics, there has been little innovation and/or product development addressing ergonomic solutions for newborns. ASST first became aware of the need for an innovative baby bathing bowl solution while working with the labor & delivery team at St. Joseph Medical Center in Baltimore. The nursing staff had become frustrated with the bathing bowl that had been recommended for a new project at the hospital. In response to the St. Joseph nursing team’s request, ASST began the design development for an ergonomic baby bowl. The new bowl design needed both a sloped bottom that conformed to the C-shaped spinal curvature of a newborn’s body as well as be fabricated in seamless solid surface. With the creation of several baby sink mockups, the teams collaboratively worked to test and analyze the final design. The result was the Cradle Baby Bowl ® that supports both a newborn’s head and back during bathing. The seamless connection between the bowl and the adjacent solid surface counter also eliminated corners that could pose an infection risk during bathing. A design that is a true blend of both form and function, the Cradle Baby Bowl ® has to date been installed in hundreds of leading edge health facilities and daycare centers throughout North America, Australia and Africa. You want your customer/owner to be delighted with the products and materials that you specify. Most architects and designers know what materials they are going to specify before a project begins. This is because most architects and designers rely on the materials that they have used in the past and they have a relationship with the manufacturing companies. When architects and designers are taking the obscure ideas of their customers/owners and turning them into a masterpiece project, the fabricators are not usually specified. The job goes to the lowest bid of the subcontractor that meets the prequalification. It may be specified that the fabricator have a minimum of 5 years’ experience working with this product. Does that guarantee a quality job will be done on time and in budget? 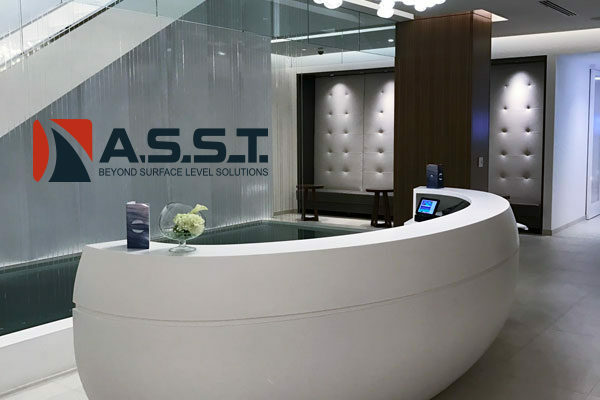 At ASST, we have 20 plus years fabricating solid surfaces. Our projects range in size from $30k to multi-million dollar projects. We know that commercial construction environments are dynamic and we plan our projects with contingencies. At ASST, we take a personal interest in our relationships with our customers. Providing quality products and services on time and in budget is what we do. specifications. Whatever you need, ASST can build it to your exact specifications, in a safe manner, and to the quality standards you expect. Contact us now online or call us at 717-630-1251.